Growing interest in specialty crops and locally grown produce offers profitable alternative markets for farmers in western NC. 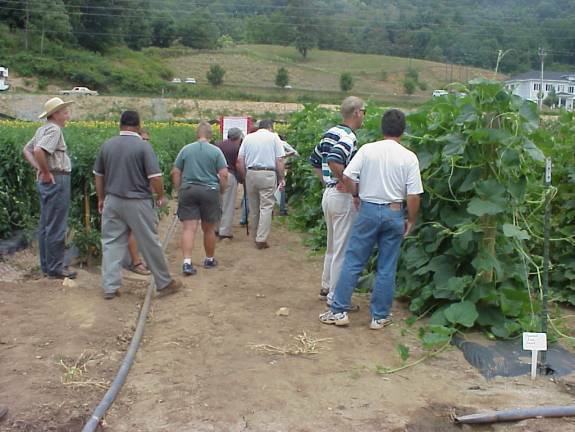 A demonstration garden was established in Haywood County to explore consumer preferences for these items. Test marketing and surveys revealed a strong demand for local produce, particularly heirloom tomatoes. This project was actually initiated by the staff of the Mountain Research Station. They were looking for produce that could be grown AND sold in Haywood County. We worked closely together to establish a large demonstration garden containing a wide variety of heirloom tomatoes, colored bell peppers, hot peppers, gourds, old-fashioned pumpkins, and broom corn. This garden was highly visible from the road and made available for inspection by all interested parties. Produce from the garden was used for marketing studies. 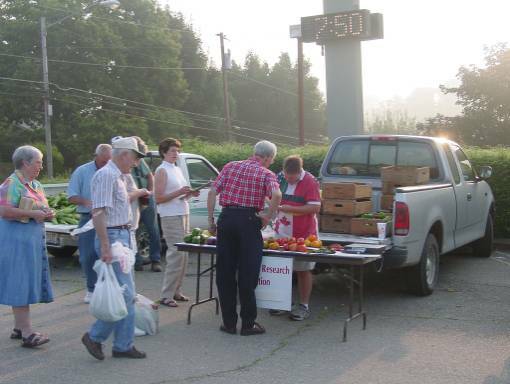 For example, peppers and tomatoes were test marketed at the Waynesville Tailgate Market on several Saturday mornings. Customers were surveyed as they shopped. In addition, we took notes on consumer buying preferences. Before the day was over, Jeanine Davis took results of the day’s research to all the produce vendors on the market. 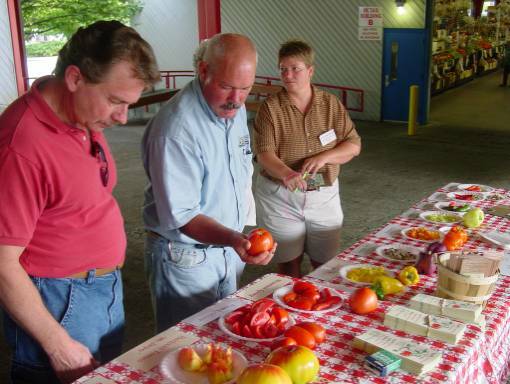 A tomato and pepper taste test was conducted at the WNC Farmers’ Market in Asheville. A large number of consumers participated in the taste test and a strong preference for heirloom tomatoes was demonstrated. Discussions with the retail vendors on the market revealed that demand for heirloom tomatoes far exceeds supply. They encourage local growers to sell these tomatoes to vendors on the market because they cannot get them through their regular suppliers because the heirloom tomatoes are too fragile to ship. A field day was held to educate growers on the tremendous number of unique and old-timey varieties available to them. This study demonstrated that there is a strong local market for locally grown produce, especially heirloom tomatoes. Several Haywood County growers will take advantage of this information in 2003. In addition, we will conduct a heirloom tomato variety trial in 2003 to assist with variety selection. What is most important to you when you shop for produce? Which of the items displayed here are you most likely to by? Have you bought specialty fruits or vegetables in the past? What fruit or vegetables do you want to buy from farmers but can’t find? Test marketing on Saturday morning at the Waynesville Tailgate Market. Taste test for heirloom tomatoes and peppers at the WNC Farmers’ Market. Field day for heirloom and specialty vegetables for Haywood County. • What Are the Best Tomato Varieties?